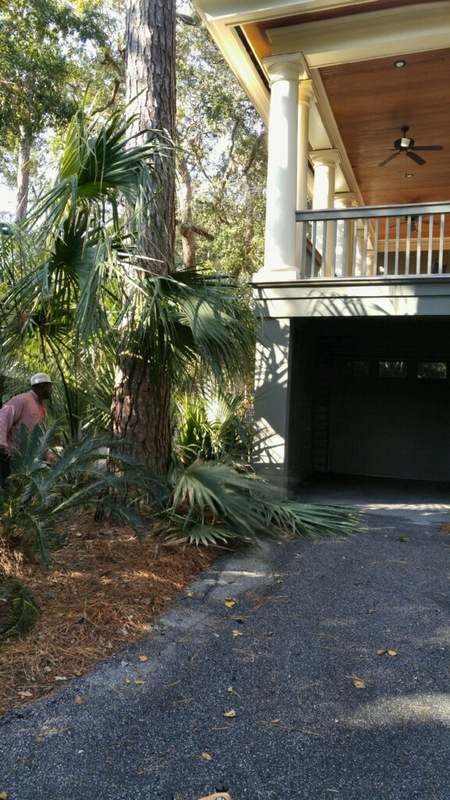 WHAT MY NETWORX CONTRACTOR DID FOR ME: Major yard cleanup, followed by biweekly maintenance. WHY I CHOSE HIM: Proactive attitude, knowledge of modern technology. 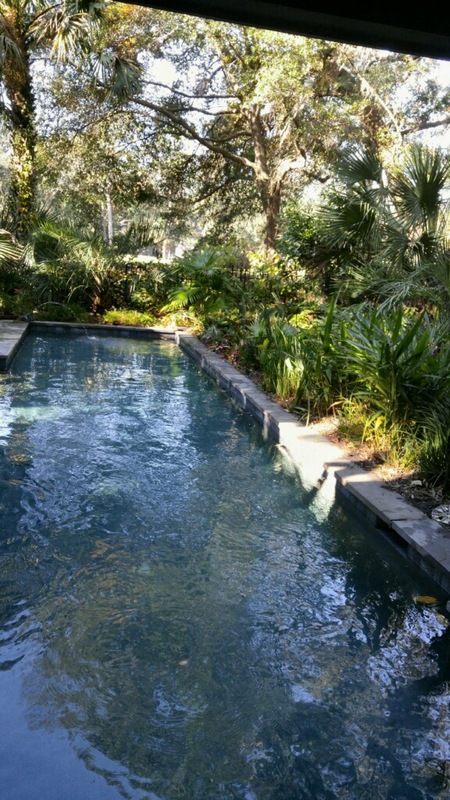 Although it’s a beautiful home, the yard was tremendously overgrown. The previous owner left us the name of the landscaper that she had been using, but honestly, I took one look at the yard and said, “I wouldn’t use those guys!” It was a mess. Frankly, I didn’t understand what she was paying them for. I think she liked to putter in the yard herself, so she just had the former landscapers come in and blow off the walkways, but that was pretty much it, as far as I could tell. 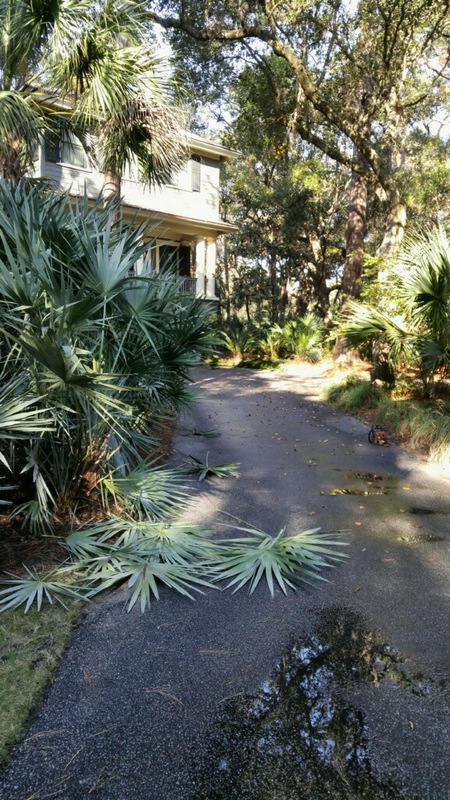 The large sand palms and palmettos had fronds so overgrown that they were slowly dying and falling over. 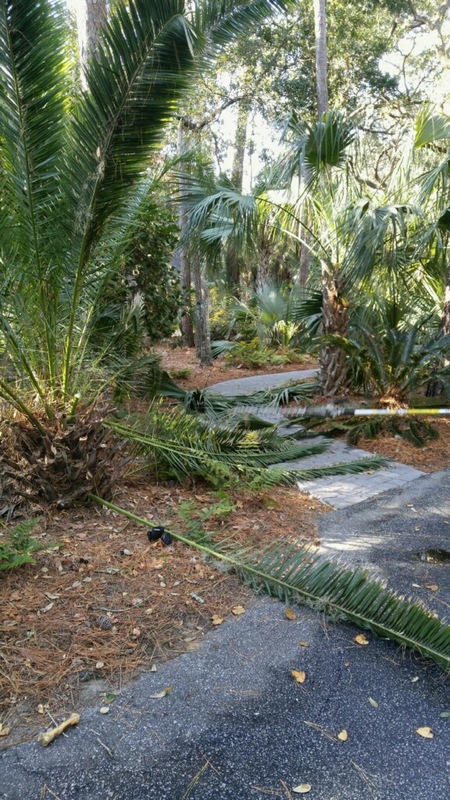 You literally could not walk down the front walkway to get up the stairs to the house without pushing things out of your way and I was afraid the palms along the driveway would scratch my car. There are a lot of podocarpus shrubs around that were also way overgrown and misshapen, which needed to be pruned drastically. The ground cover around the pool was growing way too close to the edge. It looked like it hadn’t been cut back in forever. Only half an hour after I texted him the pictures, he called me back with a quote. Once we agreed on a figure, I gave him my credit card number and asked him to send me photos when he was done. He actually texted me photos while his guys were still there working, so he could ask me, “Is this enough? Do you want it cut back more?” I liked that, somebody who understands technology. I had quotes from 2 other landscapers, who were okay, but Al was more on top of it, more proactive. He did a great job -- cleaned up everything, widened all the walkways and pathways, and trimmed all the bushes around the house to the same height. He also took a ton of pictures and sent them back to me. When the cleanup was finished, we worked out an arrangement where he’d do regular yard maintenance every two weeks. I’m not going to be at that home for a few months, but I’ve got to maintain the property. Now every other Friday he calls to remind me, “Make sure I can get in the guard gate tomorrow.” Then on Saturday he texts me when he’s done. He’ll send me pictures or phone me if there are any questions. I’m not there on site and it’s not like I can get there on the weekends (it’s a 10-hour drive or 4-hour flight), so he keeps on top of things for me. He emails me an invoice and with the last one, I just went ahead and paid him 2 months in advance. If someone asked me for a reference for Al, I’d say simply, “Hire him.” I would highly recommend him. He’s reasonably priced, he follows up, and he’s there on time like he says he’s going to be. My husband has talked to people on the golf course, who say, “When you hire a landscaper, be prepared. You’ll probably be hiring at least 2 a year, because they don’t follow up or end up not doing a great job.” It’s only been 2 months, but so far, I’ve got no issues with Al’s work whatsoever. My advice to anyone who is looking for a good contractor is: look online, especially if you don’t know anyone in the area. I had to hire several people long distance -- a pool guy, a landscaping guy, and a contractor for some construction work I’m doing in the house. So I just started googling “best contractors in Kiawah.” Then I read what popped up … the websites, ratings, and so on. If they ask me for information, I give it, because I like it when someone contacts me. That tells me they’re interested in the job. A Networx employee called me 2 hours after I’d submitted my information to see if I’d been contacted and I told them I had already hired someone. Using Networx went very smoothly. It was almost too easy ... which is not a bad thing! I’d highly recommend their services; people contacted me quickly and they got the job going. Oil Furnace Maintenance Prepares Us For A Cold New England Winter by Jerry G.